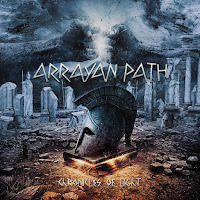 Here is the new Arrayan Path album, called "Chronicles of Light", and it's about to be released on February 5th 2016, through Pitch Black Records. Here’s a long-awaited update... We are pleased to reveal some details on the next Arrayan Path album, as well as the album’s cover! As previously announced by the band the new album will be titled “Chronicles of Light” and it will be out on February 5th, 2016. This will be ARRAYAN PATH’s fifth album and a follow-up to 2013’s excellent “IV: Stigmata”. The album was recorded at Maranis Studios in Germany and Play on Ten Studios in Nicosia. It was produced by ARRAYAN PATH and Vagelis Maranis who also handled mixing and mastering. The cover was designed by Caio Caldas. The album will also feature a “surprise” cover song. More details on that along with full tracklisting and audio samples will be announced later so stay tuned!